Uni-t UT81B is an universal measuring equipment. UT81B combines functions of full fledged multimeter and oscilloscope with analogue bandwidth up to 8 MHz. UNI-T brand is well known for its high accuracy and reliable measuring equipment. after you bought Uni-t UT81B, maybe you will ask how to use such measuring equipment which complicated with digital oscilloscope and digital multimeter in one case, is there with function user manual of Uni-t UT81B? 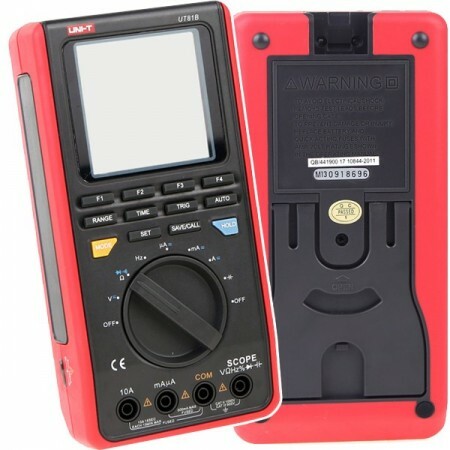 UNI-T UT81B scope multimeter is a device of medium dimensions and light weight. That is why it is easy to keep it in hand. Round knob is used to turn on power and shift mode of the multimeter. There are separate buttons for oscilloscope control and universal buttons for measuring device control in two modes. UNI-T UT81B device has small fault: some buttons are not enough touch sensitive. You need to heavily press them if you want to make them work. At the same time measurement mode switch of the multimeter works quite well. UNI-T UT81B support, section for batteries and socket for connection to Laptop on the backside of UNI-T UT81B scope multimeter. Small rubber feet in the bottom of the case help fixing measuring device when it is placed on the slippery surface. UNI-T UT81B scope multimeter's Probes are used for 2 working modes of the measuring device. Control of handheld oscilloscope which also has functions of the multimeter significantly differs from control of the fixed device. First of all, there are less buttons on the control panels and menu is much more user friendly. However, you need to get used to control even of such simple device. 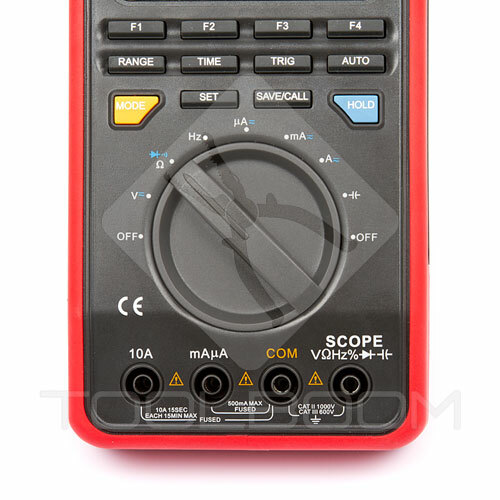 There is no Russian version of menu of UNI-T UT81B scope multimeter. There are special buttons on the control panel for oscilloscope control and general buttons for oscilloscope and multimeter control. You can switch between multimeter functions with the aid of round knob. MODE button is used for switching between two modes of measuring device. F1 button is meant for selection of the type of current and voltage to be measured (direct or alternate), and also circuit continuity check and diode test mode. Measuring range selection can be both manual and automatic. In voltage and currency measuring mode you can select type of voltage/currency (AC/DC), set mode of relative measurements (REL), manually set measuring range (RANGE). In resistance measuring mode you can select relative measurements mode and measuring range. You can also select mode of diode test or circuit continuity check. When measuring signal frequency you can turn on mode of duty factor. And finally capacitance measuring function provides only relative measurements mode. Oscilloscope function is active during voltage, frequency and current measurement. Wave form scale can be set manually or automatically by AUTO button. In order to change amplitude scale use F3 and F4 (RANGE) buttons, and F1 and F2 (MOVE) buttons are meant for positioning on the display. In order to change time scale and horizontal movement of oscillogram you need to move to TIME mode and by F1, F2, F3 and F4 buttons, signed on the BASE screen, set the necessary parameters. You can distinguish automatic scale setting from the manual in the following way: In manual mode voltage or time parameter is displayed by black symbols on the white background. In automatic mode situation is quite the opposite.